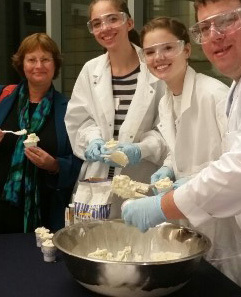 L-R: Karin Ruhlandt, Ashley Clements, Meghan Vonden Steinen and Gary Bonomo G’10 enjoy liquid-nitrogen ice cream. High school students interested in the emerging field of sustainability chemistry recently converged at Syracuse University for the first annual Green Chemistry Think Tank. 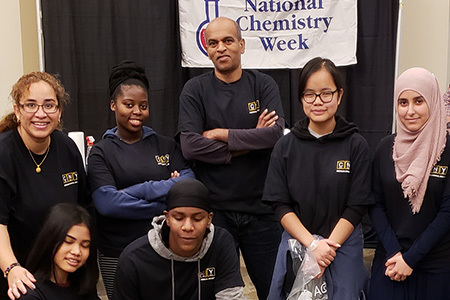 Co-sponsored by the Central New York Section of the American Chemical Society (CNY ACS) and the Manlius Pebble Hill (MPH) School, the event took place in the Life Sciences Complex and involved members of the Department of Chemistry in the College of Arts and Sciences (A&S). Bonomo G’10 and Miriam M. Gillett-Kunnath G’08—an A&S staffer and researcher, respectively—co-organized the Think Tank with Sue Foster, chair of MPH’s science department. The event highlighted chemicals, chemical processes and commercial products that do not generate toxins or waste. 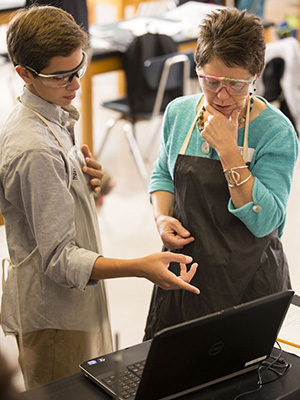 Sue Foster chairs the science department at the Manlius Pebble Hill School. The evening program drew more than 60 students from eight area high schools. Foster suspects that because the event was not admissions-driven, participants enjoyed science for the sake of it. “High school students have minimal opportunity to network with peers from other schools. Feeling the energy of the SU campus and spending the evening talking about science—it’s a win-win for everyone,” she adds. The program included opening remarks by A&S Dean Karin Ruhlandt, also a Distinguished Professor of Chemistry, and a “sustainability spin wheel,” with which students competed for prizes from A&S, the chemistry department and the Science Teachers Association of New York State (STANYS). That Gillett-Kunnath’s husband, Bobby Kunnath, devised and operated the spin wheel with students from the Institute of Technology at Syracuse Central, where he is a New York State Master Teacher, lent a familiar air to the proceedings. “Sue was amazing, and Gary, as always, was a star with the liquid-nitrogen ice cream,” says Gillett-Kunnath, self-effacingly. A research assistant professor in Ruhlandt’s lab, Gillett-Kunnath also is a technical specialist in Barclay Damon’s Intellectual Property Litigation practice area, a board member of the Milton J. Rubenstein Museum of Science & Technology (MOST) and a recent recipient of the STANYS Excellence in Teaching Award. Miriam M. Gillett-Kunnath G’08 (back row, far left) and her husband, Bobby Kunnath (back row, center), with students. She and Bonomo credit Foster for getting the word out to high school and county officials. Witness the involvement, Gillett-Kunnath says, of the Onondaga County Resource Recovery Agency (OCCRA) and “Save the Rain”—the county’s comprehensive storm-water management plan, benefiting Onondaga Lake and its tributaries—at the event. The Think Tank also featured remarks by local scientists, such as Angela Gaige, the MOST’s education director. Other presenters hailed from the Syracuse City School District, SUNY-ESF, MPH’s “Green Avengers” environmental club and the Auburn Enlarged School District.